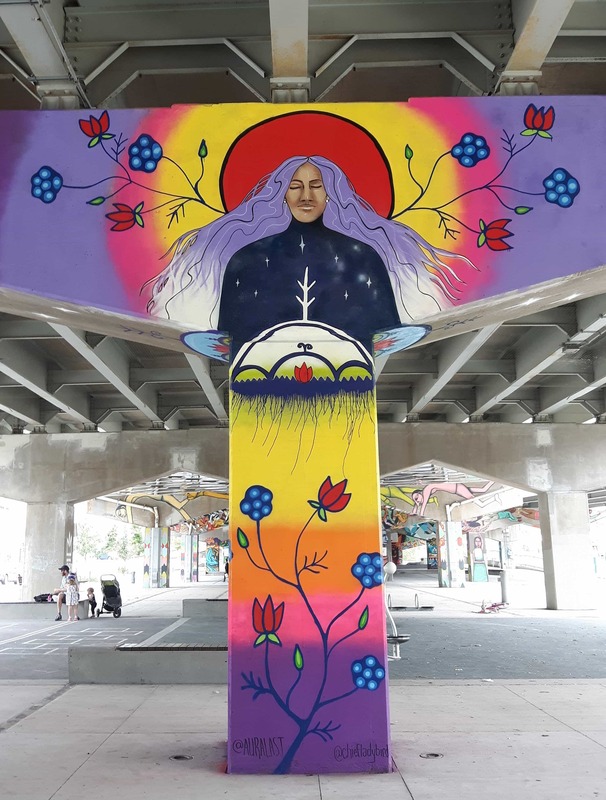 TORONTO, ON July 31, 2017– Artists have begun work this week on Multipli’city- a public art project that will transform thirteen pillars in Toronto’s Underpass Park. Seventeen artists will bring colourful designs highlighting the diversity of Canada’s people to the west side of this unique public space. The project is managed by Mural Routes and is part of the StreetARToronto Partnership Program in collaboration with the Corktown Residents and Business Association, the City of Toronto Parks Department, and Relay 2017 – Friends of the PanAm Path. The first pillar completed as part of Multiplicity, created by Aura and Chief Lady Bird. In 2015 Mural Routes, working with these partners, managed the Live Art Festival, a live painting event that saw twenty artists transform the east side of the park. Since then, Underpass Park has become a much-photographed Toronto landmark. Multipli’city will extend this animation to the west side, and will compliment the existing public artwork Mirage by acclaimed artist Paul Raff, who has graciously given his permission for this project. The all-Canadian group of artists hail from Merrit, BC, Edmonton, Montreal, Ottawa, and Toronto. Their work can be seen across the country and around the world, from Al Runt’s iconic Lee’s Palace mural in Toronto, to FONKi’s work in Cambodia (the subject of the documentary The Roots Remain). The participating artists are: Al Runt, Andrew Dexel, Annie Hamel, Aura, Chief Lady Bird, Carlos Delgado, FONKi, GAWD, Jill Stanton, Kalkidan Assefa, Layla & Lacey, Meaghan Claire Kehoe, OMEN, and Ness Lee. Project Manager Rob Matejka and Project Assistant Anya Mielniczek, themselves mural artists, will also work together to paint one pillar. Community members will see artists at work from now through mid-August, and can also follow along with Mural Routes on Facebook, Twitter, and Instagram using #MultiplicityTO. Friends of the Pan Am Path is a non profit organization that combines the power of culture and active living along the 80km Pan Am Path. Relay2017.ca arts and active living programming has been made possible by the Toronto Foundation, Ontario Trillium Foundation, Government of Ontario, Toronto Arts Council, StreetARToronto, Community Foundations of Canada, the Government of Canada, Arts in the Park, The Toronto Star, and the Ontario Cultural Attractions Fund. Special thanks to the City of Toronto, Toronto and Region Conservation.